The other day I looked at the clock and it said 5:30, but it was still light out. So of course I thought that my clock battery died. I didn’t realize that we have turned the corner, and the days were getting longer. Next it will be spring. This morning I even heard birds singing, yes not just making noise, they were singing. I believe my horrible experiences over the winter sucked my personal time clock right out of me. It’s all one big blur. January? Did we have a January this year? February is okay. Valentine’s is the only holiday in my book that makes any sense. Wait, New Years make sense too. Which brings me to March, March 15th to be exact. “Beware the Ides of March.” How fitting as I will be getting the keys to our new home on that day. It all happened so fast that I wasn’t sure if I even had time to think about it. But we are moving into the city. Not city living like New York City, nope, no high rises, but within the city boundary lines. I will be completely honest, I have never lived in a city. Oh, I once lived in Dallas proper, but that doesn’t count. That place was a organized community maybe 19 apartment complexes in a circle with a clubhouse and large pool in the middle. I remember one event we watch Rodger Staubach jump off the high dive, he was old even back then…maybe he dove. We just drank. I can’t imagine living where my every move isn’t analyzed and critiqued by people who have nothing better to do – Or where people care more about the car I drive and the brand of my shoes, than who I am. In the “city” no one will care if I put a tree in the yard, or if I paint my house purple, or if I put flowers next to the sidewalk. Where I used to live I knew the Mayor and I’m related to someone on city council. (not that that helped me in any shape or form) In the city, I know no one. My neighborhood will be mixed, very mixed and I am okay with that. And when I say mixed I mean; owners,renters, races, religion, and I really have no idea what else. We are very excited. This is the perfect new chapter considering all our existing commitments that keep us in this area. 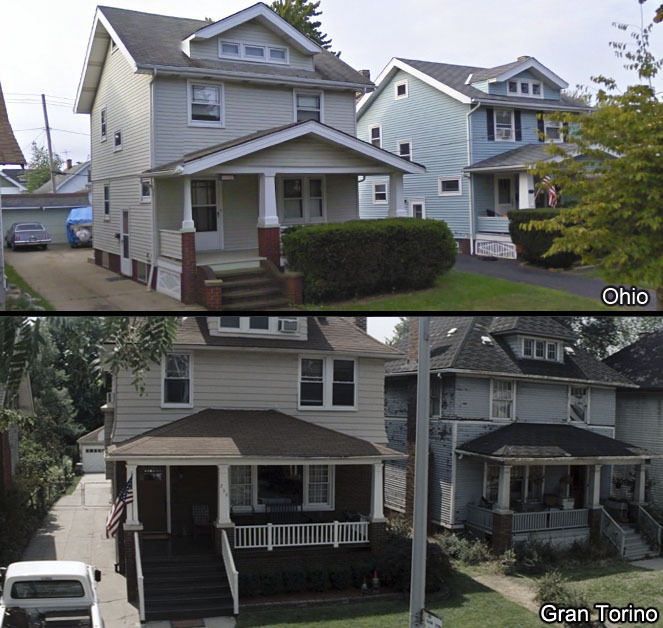 My daughter did a comparison of our new house and the one in the movie Gran Torino. Several similarities, just take a look. My question; how do you live in a place that is so big there’s nothing connecting you to the area? No schools, our children are grown, no church, we don’t go to church. Well we are about to find out. This opportunity also brings me full circle back to “unpacking the rat” because I now have the luxury of sorting as I move. I am not taking one item of clutter with me. How cool is that? I better do a good job, because I am planning on never never doing this de-cluttering thing again. Living better with less, now and forever. One-day one-thing: Appreciate the songs sung by the birds, their songs are gifts. This entry was posted in change, choice, clutter, moving on and tagged change, growth, ides of march, liberal thinker, life, lifestyle, moving on, simplify. So glad your house hunt has finally ended. How do you live in a big place? Well, I lived in cities most of my life, and I predict you’ll become very connected within your neighborhood. That’s what happened to me. The neighborhood will have it’s sense of place and unity for you. It’s fun to be a “regular” at the local cafe when you’re in a big city. Especially since you know you can escape to a different cafe if you don’t want to see other people you know. Thank you for the encouragement. I hope there is a cafe close by….that sounds like a good idea, I really don’t know much about the area. So in all it will be an adventure.